Dr. Santosh Bakaya, an academician, scholar, author, essayist, and poet from India is truly an incredible woman who has already created an important niche for herself in both the literary and the academic arena. A doctorate in Political Theory, she has excelled in teaching Political Science and also in her responsibilities as a college principal in Jaipur, Rajasthan. Her love for literature, however, had germinated at a very tender age, inherited from her father, a professor of English, and has ever since continued to fascinate her. 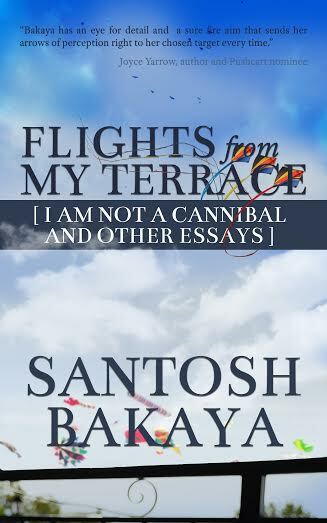 A literary journey, which had started in passion, has now reached a definitive phase with the publication of her book of essays, Flights from My Terrace. In 2014, Dr. Bakaya has received the Reuel Prize for Literature for her poem, ‘Oh hark!’ that awaits publication as part of The Significant Anthology. Moreover, her much-awaited poetic biography of Mahatma Gandhi, The Ballad of Bapu, is forthcoming in April from Vitasta Publishing. I have been fortunate enough to interact with Dr. Bakaya in various poetry and creative writing groups on Facebook, where she is a prominent, inspiring presence, judging poetry competitions, working on writing prompts and more. Having read her book, Flights from My Terrace, I thought of interviewing her via emails and that is how this conversation regarding her work took shape. Lopa Banerjee: Greetings for the day, Dr. Santosh Bakaya! I have just completed reading your recent book published on Smashwords, Flights from My Terrace. It is a remarkable odyssey of childhood memories, nostalgia, and a vivid internal journey capturing universal human feelings. Can you tell us how this book took shape in your mind and the significance of its poetic title? Santosh Bakaya: Well, at the very outset, let me thank you for your magnanimous praise of the book. I am honored and humbled. Flights from My Terrace, a collection of 58 essays published as an E-book on Smashwords, is the outcome of my ruminations on my terrace. It was in Jaipur that we grew up, so when I got a transfer to Jaipur from Bharatpur, all those memories of yore came cascading out of all nooks, crannies, and crevices. The book did not take systematic shape in my mind, but all those memories of an idyllic childhood, replete with delight, loss, wonder, and bewilderment cried to be put into words , and that is what I did, posting these pieces almost regularly on Facebook. The memory chaos in my mind was finally put to rest through this book. Our house in Jaipur is near the airport, and I would often watch the planes taking off, and this would nudge my mind into going on its own flights of fancy, so off it went flying with the kites, with the birds, and also took hopping flights to those idyllic places of the past, hence the title Flights from My Terrace. LB: Memories play an integral role in almost all of your essays, and evoke a series of emotions in the reader. Depicting them, you also reflect on your deep, diverse emotional stages. How would you describe this emotional process of depicting the complex aspects of your memory in the book? SB: Yes, memories do form an integral part of these essays, but I made no conscious effort to write a book based on memories – these memories just came like an avalanche, and during that phase of transition, I wrote about them feverishly, at times euphoric, other times pensive , and still other times, philosophical about the relentless onslaught of time. LB: Do memories and their essence form the core and crust of Flights from My Terrace? I remember the fervor with which you describe your journey from Bharatpur to Jaipur in the essay ‘The Persistence of Memory’ as “…a chunk of memory here, a sliver of memory there,” forming “a memory avalanche.” Do memories play a more organic role in portraying the artistic or metaphorical truth of your life? How would you explain it? Springing up ghost like from shady nooks. But reclaimed in these memories of a lost time. And like Oliver Twist, I plead for more. LB: You also give so much beauty and power to the seemingly inconsequential subjects, including the neem tree of your childhood, your family pets, the family dog, Nipper, and the cat, Lazy. How did you manage to fit them so endearingly into the narrative? SB: These pets were integral to our childhood, and when the memories came cascading down, how could these pets be left behind? Nipper, our pet dog was brutally killed by a junior colleague of dad’s department, and the memory of that gruesome scene still sends shivers up my spine. Lazy and Nipper had struck an exemplary friendship, which was the stuff of what fairy tales are made of. The neem, a part of our childhood, stood in the garden, a mute witness to our pranks, mischief, picnics, and our escapades, never blowing the whistle on our conspiracies. I did not have to make any conscious effort, these slivers of memory just erupted from the subterranean depths, fitting into the narrative smoothly. LB: Your father’s memories in the book form an emotionally crucial part of the narrative. How did the interpersonal relationship between your father and you tie into the overall narrative? Can you tell us what their psychological impact on you was like, as a person and also as an author? SB: My memories about my father have always been an integral part of my psyche, and have the knack of creeping out at all moments. My dad used to call me a magpie robin. So, this magpie robin invariably hops into whatever I am writing, be it a poem, or an essay. He was a towering personality with a robust sense of humor, many times bordering on the self-derogatory. A strict disciplinarian, he impacted the five of us in a very powerful way. The younger siblings were the beneficiaries of the trickledown effect of his benevolence to the two elder ones, who practiced for elocution contests and debates desperately trying to mimic the fine intonations of his powerful baritone, when he used to recite from Shakespeare classics. LB: What about the lyrically penned encounters with strangers you interacted with, travelers from the US, including your friend, author Joyce Yarrow with whom you explored a wonderful journey in Bharatpur and Jaipur? Can you share with us how these relationships have shaped in course of writing the book? SB: Being very gregarious by nature, I strike friendships easily. I have struck many such lifelong friendships with total strangers. I met Joyce Yarrow on Facebook, where we spent hours chatting, punning, alliterating, laughing away. Then she came to India, and we repeated in the real world what we had been doing in the virtual world, and became, if I may use the cliché, as thick as thieves. One of the essays, I am not a cannibal is based on our encounter in the real world. In fact, Joyce literally bulldozed me into compiling these essays and getting them published. LB: The idyllic Kashmir and your early childhood in Srinagar are integral to the overall narrative of the book. What is the role of the settings as you string the scattered pearls of your childhood and bring them together in bits and pieces alongside reflections of your present life? SB: In my essays, the settings of Kashmir and Rajasthan provide a frame of reference for readers, setting the tone and tenor of my writings. Kashmir, for me is not just a geographical entity, it is a symbol of love, peace and harmony. The snowmen, the snow clad mountains, the poplars and the pines, the majestic mountains, the boat rides and boatmen all form a part of this idyllic setting, speaking of that inherent harmony in nature and the people. The aroma of the incredible bakery items wafts across to me from a setting whose purity is pristine, innocence untarnished by the ravages of cruel times. Through these scenes and smells, I want the readers to crave for that bigger picture of harmony, love, and peace which has been sadly endangered, which the people of Kashmir yearn for, every moment. LB: Also, in your poetic, fervent recollections of memories and ruminations, there is a subtle interplay of wit, humor, and satire with which you unfold the everyday happenings around you, be it the description of a boy with a crutch, or a usual street scene. How do you make the narrative so lively, fresh at the same time, so soul-stirring and intense? SB: All this is maybe because I write from the heart. I have noticed that when I write, my heart takes over and the head rides pillion, unable even to put in a word edgewise. So, I often end up writing about seemingly inconsequential things, like the serendipitous gleam in a rag picker’s eyes, the unadulterated glee on the face of children splashing in the rains, the victory cry of a child pouncing on a runaway kite. It is the small things of life that give me the utmost pleasure. LB: You have been an author of mystery novels for young adults, some quiz books, and also your poetic biography of Mohandas Karamchand Gandhi, forthcoming from Vitasta Publishing. Can you please tell us about these book projects? SB: Yes, my three mystery novels for young adults featuring the adventurous Razdaan kids, (The Mystery of the Relic, The Mystery of the Jhalana Fort and The Mystery of the Pine Cottage) were quite successful among young adults, and I also translated The Mystery of the Relic into Hindi and adapted it for the stage. Based on terrorism, it was staged in many theatre festivals and won many laurels. My Mystery of the Whispering Woods is waiting to see the light of day. We used to conduct quizzes for schools and colleges and ended up compiling them into highly popular quiz books. Well, that planted the seed in my mind, soon the mind went into labour and The Ballad of Bapu was born. LB: What advice would you want to give new authors who plan to venture into the world of Indie publishing? Are there any specific insights, dos and don’ts you would want to share with them? SB: To all the budding writers, I would like to suggest that Indie publishing is indeed a good option. It is hassle-free, transparent, and quick. The larger publishing conglomerates cannot afford to take risks on new authors, but Indie publishers even sign unknown authors whose books do not claim to have blockbuster potential, or who do not fit the mainstream publishing mould. Lately, we find that the number of books published nontraditionally has increased, and they are thriving. LB: Finally, please share your insights into today’s world of social networking and the role an author has in it, specially your take on Facebook poetry groups, the bombardment of online journals and anthologies emerging out of the virtual space. Do you think these outlets would help emerging writing talents around us? SB: I am sure these platforms are definitely going to help budding poets/writers. In fact, I started posting these essays as notes and status updates on Facebook, and it was indeed gratifying when comments started pouring in from all over the world .Cynics might turn their noses at these social networking sites, but I have found a wonderful platform in them, which has not only catered to my urge of writing, but also helped me hone my writing skills. Writing has been my passion since my school days, but there were no social networking sites then, so all my poems, written on pieces of paper, got lost somewhere, but now they are safe in the archives of poetry groups where I post regularly, and am half way through compiling them for publication. Hats off to social networking sites and writers’ groups! ‘Oh Hark!’ written in installments in Rejected Stuff – a writers’ group on Facebook, tickled the fancy of the readers. Those days, my inbox used to be full of readers’ messages asking me not to end the long poem, but to keep writing. Egged on by the readers’ response, I kept posting it in installments, and it ran into many parts, fetching for me the International Reuel Award for Literature and Language 2014.This forms part of The Significant Anthology, featuring 176 writers, that the group is bringing out. All this was possible only due to social networking sites. There are many writers’ groups on Facebook, and some great writers making their presence felt in the world of literature, so the social networking sites are indeed a boon for budding writers. Led by Ms. Banerjee’s well-informed questions, Santosh Bayaka shares many personal anecdotes and gives us insight into the people and events that triggered her development into an inspirational writer. What a nice read! Thanks a lot for your analysis, Joyce Yarrow! It is always fascinating to read and marvel upon the workings of a beautiful mind brought out so effortlessly in this interview with Dr. Santosh Bakaya, whose prose and poetry both are literary tours de force. Thanks Lopa Banerjee! Thanks dear Ampat Koshy sir, Reena Prasad!